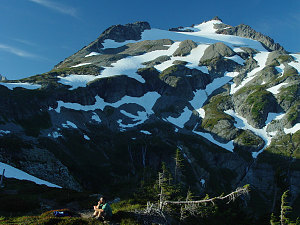 Northern Wasington is home to the rugged North Cascades mountain range. 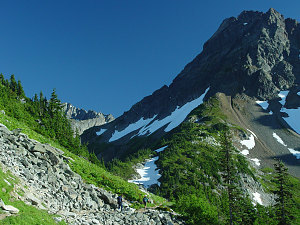 Not to be confused with the Cascade volcanos, the North Cascades a made of solid igneous and metamorphic rock, not the loose crumbly volcanic crud that makes up most of the Cascade volcanos. 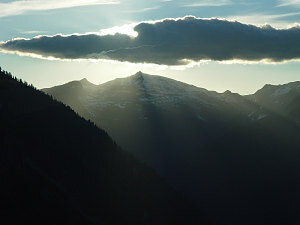 The North Cascades receive a large amount of precipitation, and rise a long way from low valley floors. 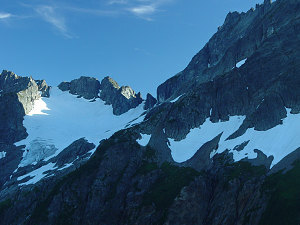 They are heavily glaciated, and because of the solid rock, have very steep sides, resulting in many slender, steep peaks, pinnacles and spires. 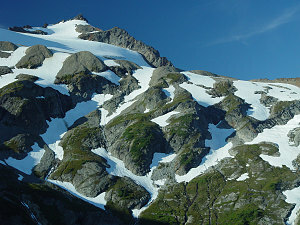 They are often referred to as the American Alps, having many characteristics in common with the Alps of Europe. 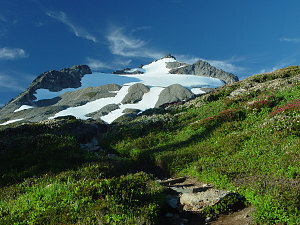 Although we do not have time to properly conquer a North Cascades peak, I feel that at least an introduction to this great area is in order. 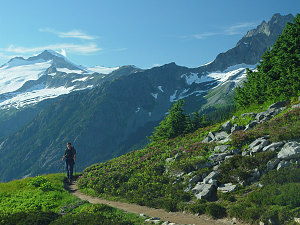 The chosen location is Cascade Pass, a low point amongst jagged peaks in the heart of the North Cascades. 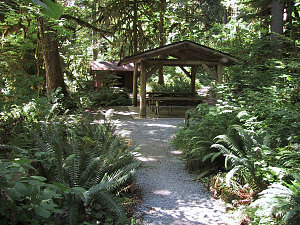 It is one of the few destinations that has a maintained trail to it, making it a good choice for a quick day hike. 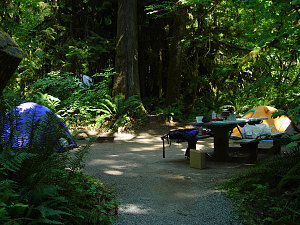 So, the next day, after a quick return to civilization, a motel, shower, and laundry, we set up camp at a quaint state park in Rockport, WA, and head off to the trailhead. 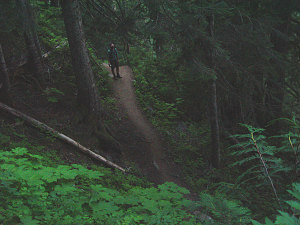 It is very late in the day (after 4pm), and everyone is coming off of the trail as we race up, anxious to see a glimpse into the heart of this wild, beautiful and forbidding looking land. 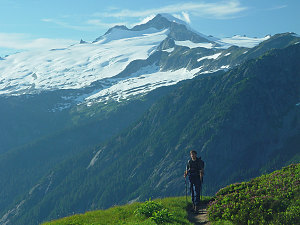 Around us, towering, craggy jagged peaks are everywhere, complete with high, thin, cascading waterfalls and hanging glaciers. 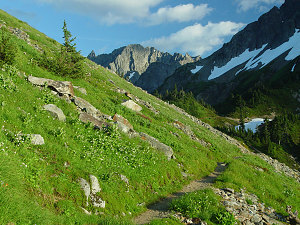 The trail does not disappoint: the pass itself is an elegant gap with green meadows and beautiful wildflowers. 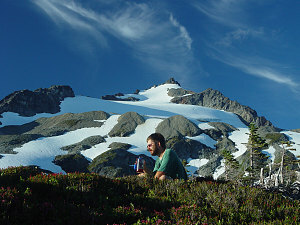 Climbing above the pass up onto the arm of nearby Sahale Peak, we gain a high meadow with a grand view of the surrounding mountains. Markus is suitably impressed with the scenery. 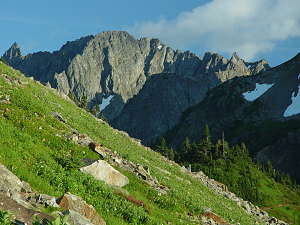 Interesting looking summits are everywhere - Sahale Peak, closest to us, looks like a fun fun scramble from this point - but we just don't have the time or the gear, so after a brief break we half-walk half-run back down to the car, arriving just ahead of the sunset. 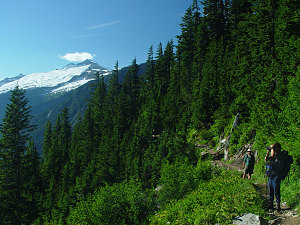 Although this was a beautiful hike, our most impressive and challenging outing awaits the last few days of our trip: a 3-day climb of Mount Baker - another big Cascade Volcano. 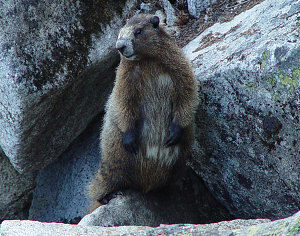 Click here to view the story of that climb.